I realize there's absolutely nothing to give a sense of scale here, so I'll just tell you: it's a big hat. 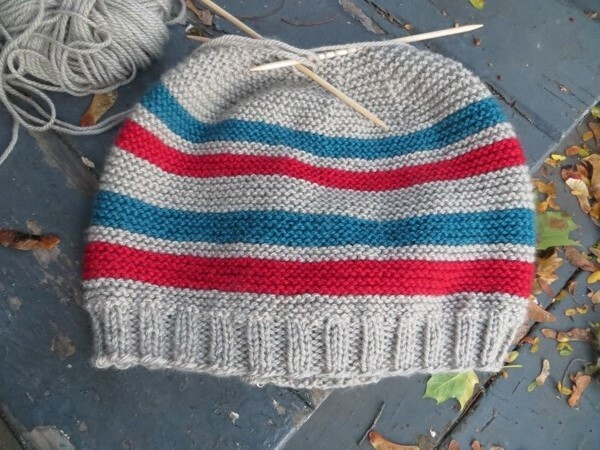 Originally, I was envisioning a really loose slouchy hat - the equivalent of giant, warm pyjama pants that you put on after a long day of shoveling snow. Sort of a woolly bag you could pull on and then pull over so it would hang to one side of your head. Well, it is. To get specific: if I pull this thing all the way down so the crown is resting at the top of my head, then the end of the ribbing is resting on my chin. And by 'chin', I mean the top of my neck. We don't even really need to talk about how wide it is, do we? Because it's also very wide. Yep, it's a really, really big hat. I have more yarn! I don't actually have to rip this out - at least, not until I have a much smaller replacement and am sure it's making me much happier. Oh well. I've decided to have a good weekend anyway, and I hope you do as well. See you Monday!